Hey, wow, it's Tuesday already! 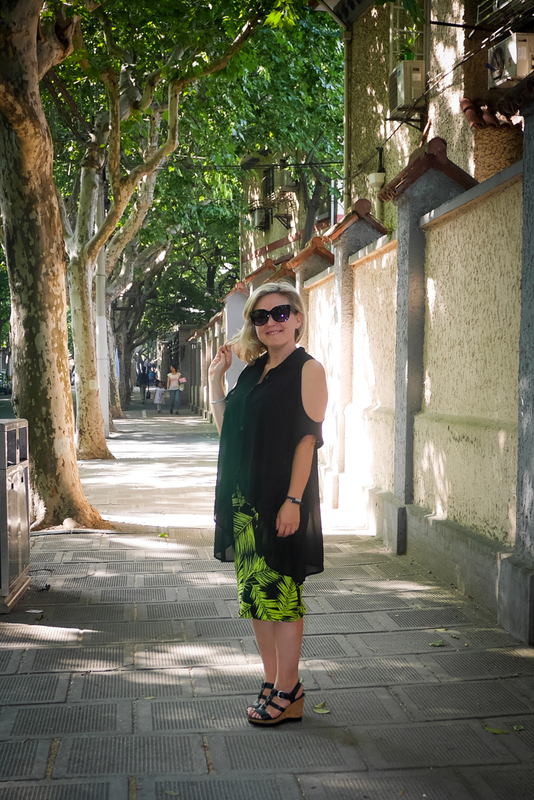 Yesterday was a work holiday for Husbie, and so we actually had a long weekend together... but we're trying to save some money so we hung with friends and didn't get out of Shanghai like a lot of people do. It was lovely and quiet (as far as a massive city goes) and it's always the best when there's no work! 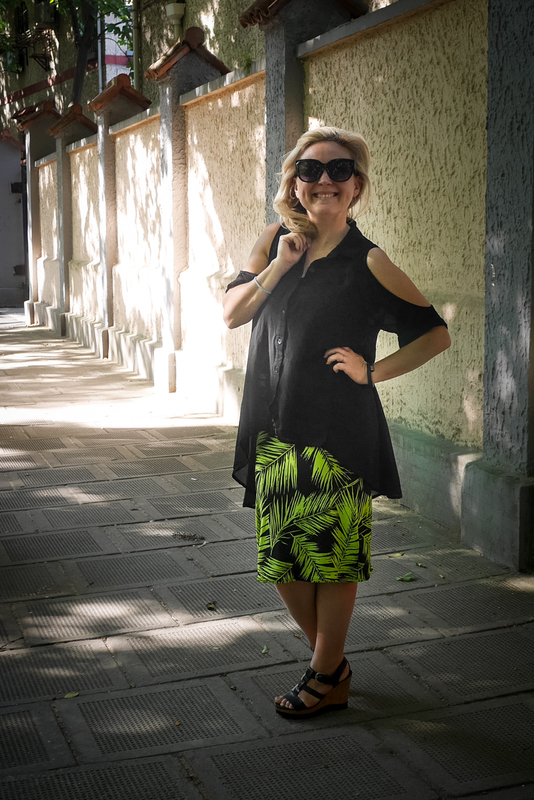 Today I thought it's time to quickly write up about my neon fern skirt... a really straight forward stretch knit fabric DIY pencil skirt that I made during May. Same fabric as my latest Manado Dress and same shape (and construction) as my Golden Jubilee Wiggle Skirt. It's two pieces, a skirt piece and a waistband piece sewn into tubes, and then attached. Very straightforward. And there are quite a few DIY tutorials online for this kinda thing, no waistband elastic needed if your fabric has enough thickness and reboundness. Is it called recovery? Not sure. Again, fabric description is not my strongest point... but this one feels so comfy to wear, especially around your middle. These photos are from a hot summer's Saturday, and we'd been out for lunch with some new New Zealand friends, and it became way hotter than I expected. 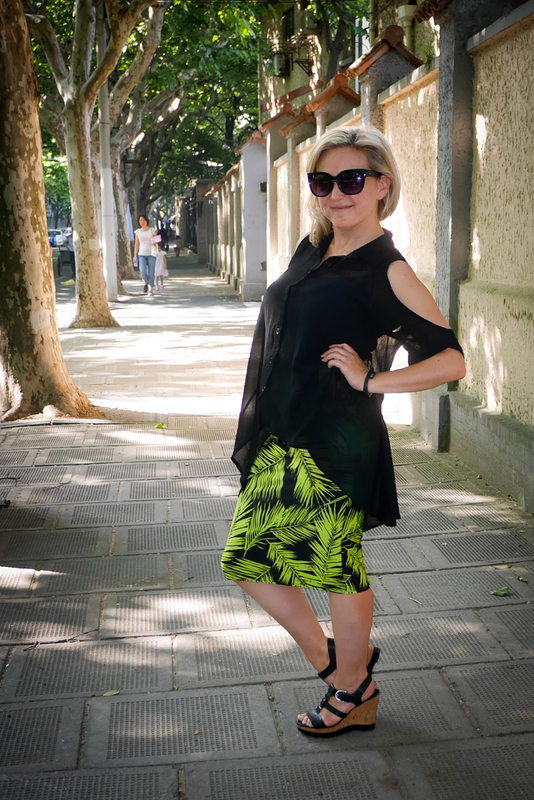 I like my floaty op shopped shirt (it reminds me of my friend Nina Las Vegas) but I think it is styled better with short shorts and leggings than with this pencil skirt. Plus, I look hot and a little bit wilted. We started to stroll home, took these photos and as Felix was feeling a bit sick we jumped in a taxi soon after. Wish there was more to write about this one, but you know how fast stretch fabric is to sew up especially with an overlocker! It's like 4 seams... and the hem was a slow topstitch on the straight stitch machine that is just OK not perfect. I broke my twin needle so have to order a new one from Taobao this week! Taobao is like all the online shops of China all rolled into one! So! I thought I'd try out some larger photos here, because I only had a few piccies of this skirt... just to test what it looks like on my blog. Let me know if they're TOO big but at the moment they look ok on my little laptop... I have to scroll a little more, but at least the skirt is a little larger. The print is so great, I'm happy I have two versions of it, now with this skirt and the swing dress! But yeh. Staring at my black wedges now, I actually want more summer shoes... I only have these and my yellow platforms (or maybe they're flatforms - hee hee) with me here in Shanghai. And thongs, but the streets are quite dirty, so I don't feel the best wearing the flip flops as I would at home! In China, we wear slippers that are like thongs inside and at the pool! So funny the habits I'm picking up here! I carry tissues with me everywhere, as toilets most of the time don't have toilet paper (!) and you ALWAYS take your shoes off going into people's houses. This week, I also realised I know more Chinese than Japanese ... which is a bit weird... I studied Japanese through High School and did first year uni (just one semester) so in 9 months of living here in Shanghai, and studying it one-on-one with my teacher once a week, I feel my conversations are really going places! I'm amazed! Anyways, here are some notes to finish with and hope you're having a great week! Thank you for reading, as always!!! While Sewing: All came together fine, but had to reinforce the hip seams where it joins the waistband as it's right on size.